Two of our female athletes enjoyed a successful trip to France over the weekend with both of them finishing on the podium at the annual Semi Marathon de Boulogne-Billancourt (19 November) in Paris. 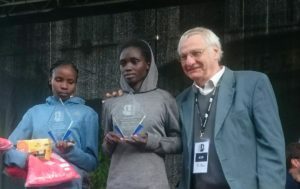 In her first international race for several months and in bright, calm conditions, Perendis Lekapana clocked a superb 69.11 for second place, around forty seconds behind race winner Rehima Tusa from Ethiopia. For Perendis this was a personal best, erasing her previous mark of 69:49 (set last year) by some margin. She was followed over the line by her Run-Fast teammate Josephine Chepkoech, who recorded 69:44, her fastest half for more than two years. In the men’s race, Elias Kiptoo Kemboi finished a disappointing 7th in 63:22. Elsewhere, Paskalia Chepkorir finished 6th in the highly competitive Delhi Half in India, clocking 68:47. Meanwhile in the Valencia Marathon in Spain, new signing Austin Roth proved his calibre with a new best time of 2:18:05, finishing 21st overall. In her debut marathon, Polline Wanjiku recorded 2:36:25.